For over than a century, neurosurgeons have tried to develop surgical routes in order to reach in a safe way the sphenopetroclival region. Lesions located in and around this area, have been classically considered as inoperable, leading to poor prognoses and even lethal outcomes. However, thanks to the great advances in surgical equipment, as microsurgical and neuromonitoring techniques, but especially the increased neuroanatomic knowledge, neurosurgeons have accepted the challenge to deal with these formidable lesions. One of the main challenges when facing how to approach these tumors is their deep location at the center of the skull base. They are usually hidden behind important bony structures as the petrous bone and its neurovascular contents. Thus, it is understandable that reaching these spaces will necessarily require different degrees of petrous bone drilling, and before planning our surgical route, we must perfectly understand the three dimensional intrinsic anatomy of this bone. As it can be understood from this picture, aiming to reach the sphenopetroclival junction and ventrolateral aspect of the brainstem will require an anterolateral approach in order to avoid as much as possible the cerebellar and temporal lobe retraction. The posterior petrosal approach is mainly used for lesions with a big posterior fossa component, however, as we will see later on, its different combinations and extensions will let us reaching also the supratentorial space in a safe way. When dealing with large sphenopetroclival tumors, the lateral suboccipital or retrosigmoid approach allows enough access to the cerebellopontine angle (CPA), however the surgical view is limited to the posterior fossa, and the supratentorial space is out of our field. Moreover, the clival and ventrolateral brainstem exposure requires an excessive cerebellar retraction. The anterior subtemporal trans-petrous apex approach (anterior transpetrous approach) provides a good exposure of the supratentorial region, however it leads to an extremely narrow corridor in cases of large tumors mainly located in the infratentorial space. On the other hand, the transmastoid approach allows better access to the clival and paraclival regions, however again the supratentorial part of these tumors is out of our control. With this scenario, neurosurgeons have shifted to the combination of these surgical approaches taking advantage of the benefits of each of them, highlighting the main dogma of skull base surgery, which means a limited brain retraction, minimizing trauma to the temporal lobe, cerebellum, brainstem and cranial nerves. In this sense, the approach that has been shown as optimal is the posterior transpetrosal with its different extensions and combinations. A meticulous intrapetrous bone work skeletonizing the sigmoid sinus and preserving the inner ear structures, as well as the facial nerve intrapetrous segments, guarantees a wide exposure, minimizing the operative distance and healthy tissue retraction. This surgical route provides a great exposure of the CPA, petroclival region, posterior aspect of the cavernous sinus, as well as the middle and superior segments of the clivus. Before understanding these different routes, it is mandatory to gain a three-dimensional view of the temporal bone. The temporal bone is externally divided into squamosal, petrous, mastoid, tympanic, and styloid parts. The squamous part encloses mainly the temporal lobe and is connected to the sphenoid and parietal bones. The mastoid part is usually well pneumatized and represents the entry point to start the posterior petrosectomy. It is separated from the suboccipital bone posteriorly through the occipitomastoid suture; superiorly from the parietal bone and squamous part through the parietomastoid suture and supramastoid crest respectively; and anteriorly it is connected with the external auditory canal through the spine of Henle. Different groups of neurosurgeons and otologists developed three different posterior petrosal extensions: retrolabyrinthine (green), translabyrinthine (blue), transotic (light brown) and transcochlear (brown). Each of these variations offers a progressive wider surgical view at the expense of an increase in postoperative morbidity due to middle and inner ear damage, as well as possible facial nerve and intrapetrous carotid artery damage. The patient’s position is extremely important, due to the fact that these procedures are usually quite long and both the patient and surgeon should be in a comfortable position. We prefer to place the patient in lateral position. Surgeons should be aware of potential complications so as to try to avoid them and to act rapidly in case they appear. The most common are related to brachial plexus and neurovascular compression. This is why the patient’s arms should rest comfortably. A slight head rotation to the ipsilateral side allows moving the coronal plane of both shoulders away from the surgical working space allowing the surgeon enough maneuvering freedom. 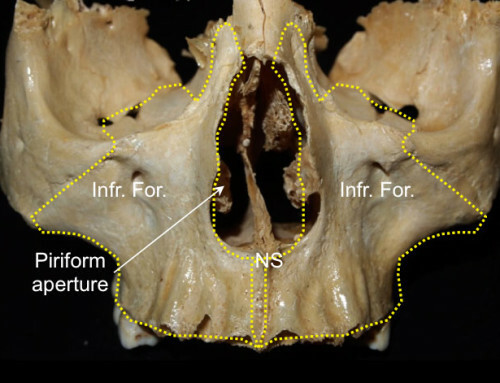 For a combined supra- infratentorial posterior transpetrosal approach the incision should expose a large part of the lateral aspect of the temporal bone and, partially, the suboccipital bones. This is why we use a question mark incision starting three fingers above the zygomatic process, moving posterosuperiorly and posteroinferiorly surrounding in a semicircular fashion the pinna, descending until two fingers below and behind the mastoid tip. The whole flap is reflected anteroinferiorly trying to carefully identify the posterior wall of the external auditory canal. Some periosteal layers can be kept intact just in case they can be used for a future autologous duroplasty. The underlying bone should be cleaned enough in order to identify some relevant anatomical landmarks. The spine of Henle just posterior to the posterior wall of the external auditory canal, the mastoid tip and the posterior root of the zygoma will be the other superficial limits for the initial mastoidectomy. Thus, the mastoid tip, posterior root of zygoma and asterion will mark the ‘superficial triangle of attack’. Mastoid drilling may start at the level of the outer table, or it can be precisely elevated and preserved with an oscillating saw. Once removed the outer table, a 5-6mm cutting drill is used to go deep within the ‘triangle of attack’. We recommend starting at the level of the temporal line in an anteroposterior direction. This landmark usually coincides with the middle fossa dura mater. The next step is sigmoid sinus skeletonization. This venous structure has no surface anatomical landmark, thus it is usually recommended to drill in an oblique direction from the asterion to the mastoid tip. When the inner cortical bony layer appears, it is recommended to use a diamond drill. The traced line between the posterior root of zygoma and the mastoid tip just posterior to the external auditory canal is the next part to be drilled so as to complete the ‘deep triangle of attack’. For a combined transpetrosal approach three more burr-holes are added. One in the anterior aspect of the exposure as basal as possible just above the root of zygoma attempting to reach the middle fossa floor, another parietal burr hole and the last one just posterior to the asterion over the transverse sinus. The dura mater must be carefully dissected from the inner table as well as the transverse sinus. The supra- infratentorial craniotomy is then completed in one piece. The retrolabyrinthine extension is recommended for small and medium size lesions at the petroclival junction and adjacent to the middle clivus. It is also appropriate for large tumors at the CPA. The deep drilling should be taken progressively and gradually being extended from extreme to extreme trying to avoid creating deep and narrow cavities that would obscure our three-dimensional understanding. A relevant anatomic structure that will be seen next is the mastoid antrum in an anterosuperior location. This cavity has a medial wall that is the lateral extension of the labyrinth, which actually is the lateral semicircular canal. At this stage, the cutting drill should be avoided, and careful skeletonization of the sigmoid sinus, middle fossa and CPA dura mater as well as the lateral semicircular canal should be performed using a thin diamond drill. The arcuate eminence represents the superior aspect of the labyrinth, marking the relative position of the superior semicircular canal. At this stage of the approach, the sigmoid sinus has been completely skeletonized, as well as the three semicircular canals wit the aid of a diamond drill. A three-dimensional orientation in this deep region is needed in order to avoid an eventual damage of the inner ear structures hidden in this area. Each of the three semicircular canals is oriented on each of the three orthogonal planes of the space. Generally the lateral semicircular canal is the first uncovered medially in the antrum, and follows the axial plane. The superior semicircular canal is represented by the arcuate eminence in the middle fossa floor and is parallel to the sagittal plane of the space. However, the posterior semicircular canal is oriented following the coronal plane and is parallel to the cerebellar surface of the petrous bone, just anterior to the endolymphatic sac. Just anterior to the lateral semicircular canal, the middle ear is exposed and the incus is visualized. The incus and the lateral semicircular canal are two relevant anatomical landmarks in order to identify the mastoid segment of the facial nerve. Another good reference is given by the digastric groove, which can be uncovered after drilling from the lateral semicircular canal to the mastoid tip. The nerve inside the facial canal follows this craneocaudal direction between the labyrinth and the stylomastoid foramen. Under the microscope, the chorda tympani might be identified, directed to the middle ear, carrying sensory taste and autonomic fibers. In this anatomical preparation we are watching the petrous bone from above, and the direction of the chorda tympani is better understood entering the middle ear just anterior to the LSC and inferior to the incus and maleus travelling just below the tympanic membrane. For anatomical purposes, the semicircular canals can be opened so as to understand the junction between the superior and posterior semicircular canal at the level of the common crus. If the drilling work is carried out posteriorly to the CPA dura mater, the endolymphatic sac is encountered entering into its ridge. This dural fold also represents an excellent anatomical landmark during this and other approaches directed to the internal auditory canal, because this fold is located 10-14mm lateral to the VII cranial nerve -VIII nerves complex entry point in the petrous bone in the same axial plane. The posterior fossa dura mater forms the well-known Trautmann’s Triangle just posterior to the inner ear structures, superior to the jugular bulb, inferior to the superior petrosal sinuses, and in front of and medial to the sigmoid sinus. This triangle represents the operative corridor to the infratentorial part of the petroclival meningiomas. This exposure represents the surgical field given after performing a combined supra- infratentorial posterior transpetrosal approach with retrolabyrinthine exposure. This operative approach is completed after ligating the superior petrosal sinus and splitting the tentorium towards the incisura. After understanding the retrolabyrinthine exposure let’s move a little more deeper to describe the translabyrinthine extension. The partial and complete translabyrinthine extensions offer similar working corridors. This combined supra- infratentorial posterior transpetrosal approach with translabyrinthine extension is usually employed to remove medium sized lesions medial to the petroclival junction and middle clivus meningiomas. It also represents a good choice to deal with giant meningiomas enclosing the vertebrobasilar complex, and lower cranial nerves, when the goal is a tumoral cytoreduction. In order to reach a transcrusal extension (partial translabyrinthine), the common crus of the superior and posterior semicircular canals is drilled and immediately sealed with bone wax so as to avoid loosing the inner ear tightness. This extension involves an increased surgical field compared to the retrolabyrinthine exposure. If a complete labyrinthectomy is our goal, the lateral semicircular canal should be drilled away carefully under the microscopic vision with a 2mm diamond drill, taking special care of the junction of the facial nerve mastoid and tympanic segments, which lies just anterior to this semicircular canal. The medial wall of the common crus must remain intact so as to protect the labyrinthine segment of the facial nerve. This anatomic landmark is also useful to understand the deep position of the internal auditory canal and vestibular nerve. Separating the petrous dura mater in the CPA, the porus acousticus internus is uncovered after partially drilling the posteromedial wall of the common crus. Here the dural opening is shown in a T-shaped fashion. The superior petrosal sinus is ligated and cut just before its entrance in the transverse/sigmoid sinus junction. Once the tentorium is totally opened until reaching the tentorial incisura, a wide exposure of the middle and posterior fossae is gained. Without any kind of retractor this is the gained surgical view of the CPA. From cranial to caudal, the AICA’s labyrinthine branch, VII/VIII complex, as well as the lower cranial nerves and sigmoid sinus are shown. If we kindly elevate the basal aspect of the temporal lobe, a wonderful view of the petroclival region is gained, even identifying the IV cranial nerve between the SCA branches, the motor and sensitive fibers of the trigeminal nerve, as well as the ventrolateral aspect of the protuberance. Figure 23 This is the scheme of a CT scan showing the translabyrinthine extension. The next stage will consist on a complete skeletonization and transposition of the facial nerve so as to expose and remove the cochlea. The last and most aggressive extension of this approach involves drilling the cochlea and subsequently sacrificing all the inner ear structures except the facial nerve that has to be skeletonized (transotic) or even mobilized (transcochlear). With this transcochlear extension, previously operated or radiated giant sphenopetroclival meningiomas may be approached, or even when a bilateral extension is present completely encasing the vertebrobasilar complex. The posterior wall of the internal auditory canal is drilled and its dura mater opened exposing the inferior vestibular and acoustic nerves. Delicately moving these nerves, the facial meatal segment shows a relatively anterior position compared to the cochlear nerve, while the superior vestibular remains hidden anterior to the inferior vestibular nerve. The mastoid facial canal must be precisely drilled throughout all its length with the aim of setting the mastoid segment of the nerve free. The lateral semicircular canal ampulla is opened and drilled exposing the junction between the mastoid and tympanic segments. 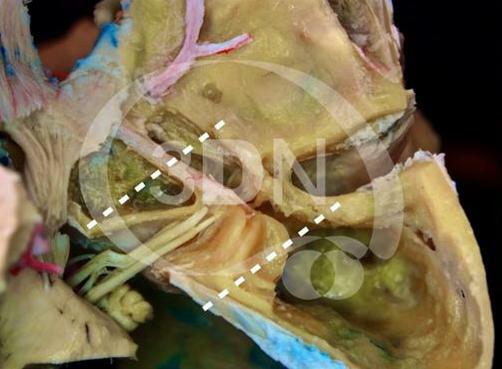 At this point, the greater petrosal nerve should be identified and sectioned at the level of the geniculate ganglion. This maneuver will let us mobilize the meatal, labyrinthine, tympanic and mastoid segments of the nerve out of our surgical corridor, thus exposing the lateral wall of the cochlea. It is important to try to preserve as far as possible the chorda timpani of the mastoid segment. This facial nerve transposition will let us drill the cochlea from its lateral wall. When the scala tympani and vestibuli start appearing, a diamond drill should substitute the cutting one in order to avoid possible injury to the lateral wall of the petrous segment of the internal carotid artery just medial to this structure. After completely drilling the cochlea and remove the vestibular and cochlear nerve roots; a clear view of the petrous segment of the internal carotid artery is gained. Once this vascular structure has been localized, the rest of the petrous apex can be drilled away safely until reaching the lateral wall of the Meckel’s cave and the middle clivus. After movilizing the VII/VIII nerves, a wonderful view of the superior and middle clival regions, Meckel’s cave entrance and anterolateral aspect of the protuberance is gained. This is the scheme of a CT scan showing the Transcochlear extension.